Glenda wrote, "Attached you will find pictures from Laura Striegler & Loyd Wilson's 50th Wedding Anniversary Celebration. 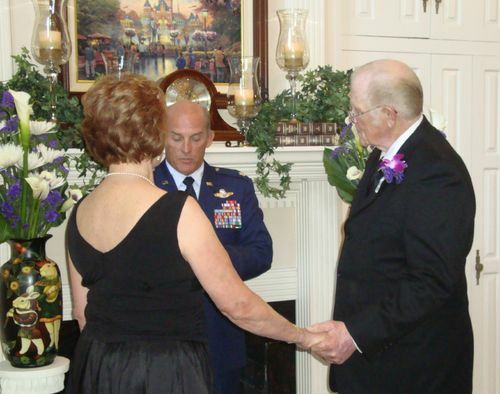 Their Air Force colonel son-in-law officiated as they renewed their vows to each other for which they used Ruth 1:16-17. It was beautiful. Before they exchanged vows, they asked everyone who had been a member of their wedding party 50 years ago to please stand. Many of us were there. One of Loyd's former teachers was there - and he had been a groomsman for Loyd at their wedding! Pat Roberson, one of the bridesmaids, as you may know, passed away recently." Laura added this information to that which Glenda sent, "Also missing was Zynda Carson, who was also a bridesmaid, but who is among our departed classmates. Glenda didn't mention the obvious either - that SHE, Glenda, was one of my bridesmaids as well. Others from the original Wedding Party who were present were my two sisters, who were my Matrons of Honor, and my Niece, who was our Flower Girl and my Nephew, who was our Ring Bearer.